A new year, a new artistic endeavor… a blog! I’m hoping this space serves not only as an opportunity for me to keep a record of my pieces and the spirit and thought behind them, but also as a place for me to share information about other artists and projects that inspire me. I thought I would begin by sharing some thoughts about the most ambitious beaded painting I have created so far; it is called “Renewal Springs from Woman,” and it took me almost 350 hours to complete! My goal with “Renewal Springs From Woman” was to create an abundant and light-filled piece that empowers and honors the life-giving female spirit. In making it, I also sought to challenge the false dichotomy between “art” and “craft” that exists in the modern art world. The laborious beadwork echoes the Victorian sentiment that the painstaking, delicate and refined nature of embroidery and the decorative arts make them suitably “feminine,” but by placing embroidery within the context of a large-scale painting on a canvas, I hope to help it escape the restraints once laid upon female artists in the name of modesty and womanliness. While the creative abilities of previous generations of women were often unsung, their access to the art world mostly limited to making “decorative” arts for the home, my goal is validate and collaborate with them by recycling their lovingly made doilies and lace into paintings, where their “women’s work” can be newly appreciated for its unique beauty. 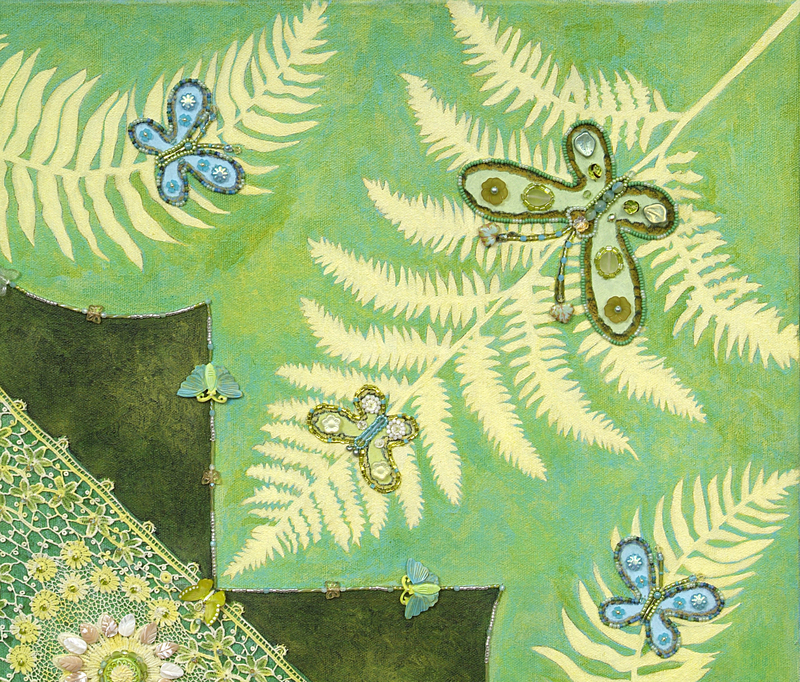 A friend had given me some exquisite floral lace, which I carefully cut into four pieces and painted a pale yellow before adhering it onto the canvas, and I used a vintage handkerchief with a delicate butterfly design for the center. It was important to me to use fabrics passed down to me by my maternal grandmother, since this piece honors the creativity of generations of women. Pieces of her handmade draperies became four large butterflies, which symbolize women in each corner of the world. From all directions, they are giving birth to pure souls, who begin their lives in the world of nature and ultimately travel throughout heavenly realms. 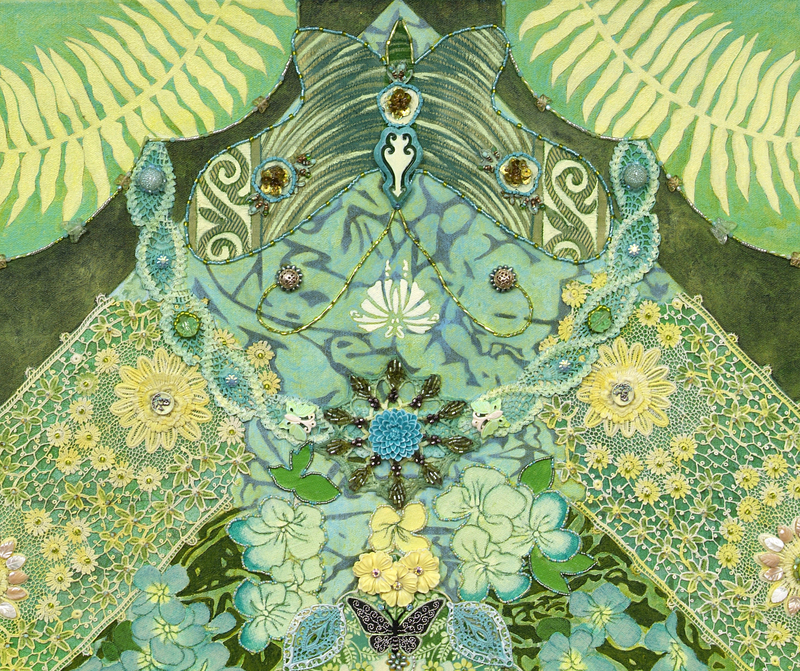 Nature is symbolized by each corner’s beaded butterflies and abundant ferns, which I collected on a hike near my home and used to make a detailed, symmetrical drawing. This was then painstakingly transferred onto the canvas and painted with several transparent layers of paint to create a luminous effect. The pearls in the center of the canvas surround a Persian carpet motif symbolizing woman, which in turn encompasses a carved mandala from India that features a tiny nine-pointed star. I also used carved flower and butterfly beads from China and Costa Rica, Victorian-era metal buttons, and vintage European earrings and beads to create this intricate beaded painting. 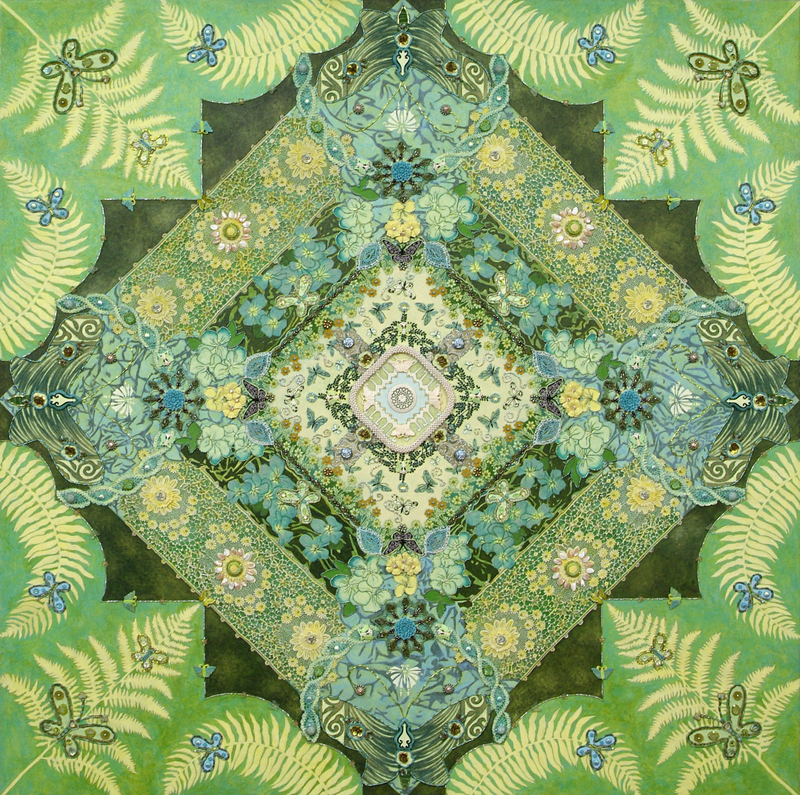 The strong diamond-within-a-square composition is reminiscent of the bold Amish quilts that I have long been inspired by, but the elaborate flora and fauna echo the aesthetic of Persian carpets; therefore, the overall effect is a cross between art forms of East and West. In this painting, as in all of my recent work, I am striving to bring together artifacts from many cultures as I create harmonious, balanced pieces that draw equally on the traditions of painting and embroidery.